Easter food decorations created out of a variety of fruits and vegetables are a unique way of making the holiday celebrations more festive. Several of my students have sent photos to me of their Easter food decorations. So, I thought I’d spread the creativity and share them with all my readers as well. Janette Cancel created a set of three Easter carvings, including a cantaloupe bunny and a Happy Easter watermelon. 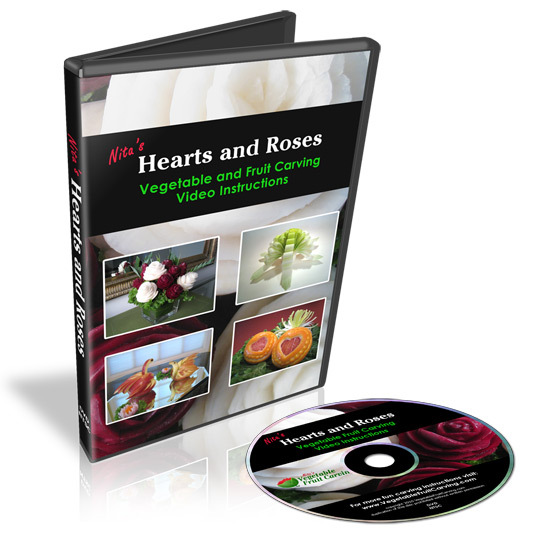 Her third carving is a watermelon rose, which you can learn about in my Carving Watermelons – Roses, Buds and Leaves lesson. Janette’s trio of Easter food decorations offer several ideas for creating fun holiday carvings. It’s a pretty arrangement, isn’t it? You can see another version of this bunny that I made for one of my Easter parties. Here is what Janette had to say about her photos. 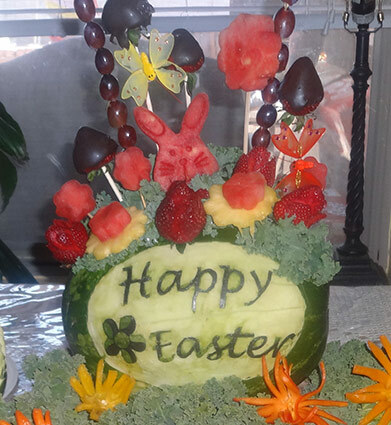 The watermelon Happy Easter carving features a bouquet of fruit skewers with chocolate-covered strawberries, grapes and melon flowers. You’ll find a free lesson showing how to make a chocolate covered strawberry bouquet by clicking here. 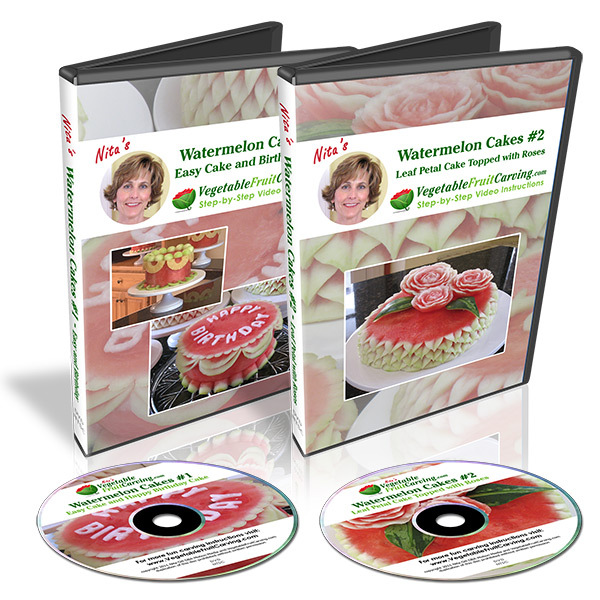 You can learn to carve watermelons with word in my video lessons, Carving Letters and Words. Here’s a close-up of Janette’s Happy Easter watermelon carving arrangement. I like how Janette added the carved watermelon Easter bunny to her fruit bouquet. 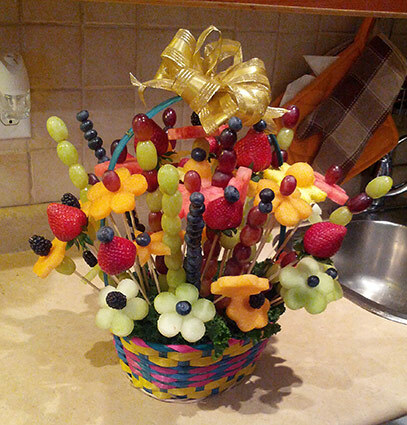 Here’s a cheery and colorful Easter basket fruit bouquet that Anjum Hasan made. This was Anjum’s very first attempt at a fruit basket. Isn’t it pretty? Creating a similar bouquet is easy and just requires an assortment of fresh fruit and wooden skewers. And, it’s a heck of a lot more healthy than a basket of candy! You can learn step-by-step how to make a lovely fruit bouquet in my Bouquets and Butterflies video lessons. Here is something completely different. 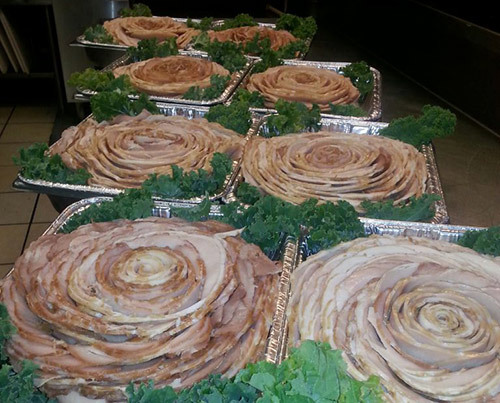 These are sliced meat roses created by caterer George Reed. This is a great idea that would add an element of surprise to your Easter table. 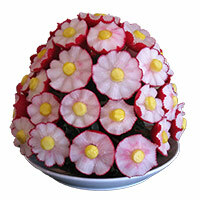 Here’s a creative edible food decoration – caterer George Reed’s sliced meat roses. Omusugu Henry shared one of his Easter food decorations, which features a cross, and is great for representing the more religious side of the holiday. 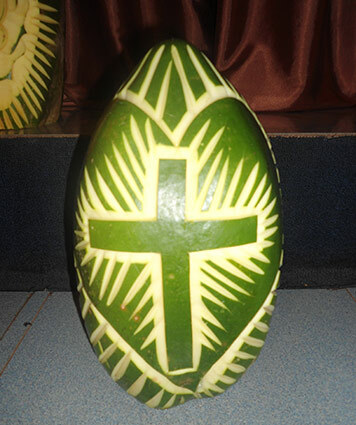 Omusugu’s watermelon carving with a cross. This adorable bunny can be learned in my Melon Bunny and Calla Lilies lesson, which is also part of the Vegetable and Fruit Carving 101 course. 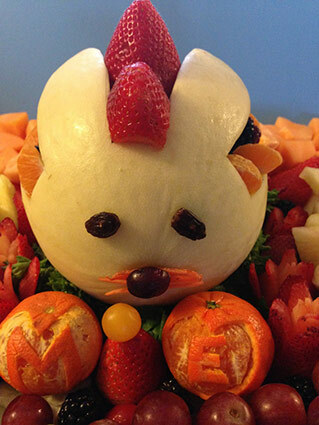 One of my students, Ernesta Memorando, shared the following two photos of her melon bunny Easter food decoration. Ernestina’s melon bunny Easter decoration doubles as a fruit bowl. 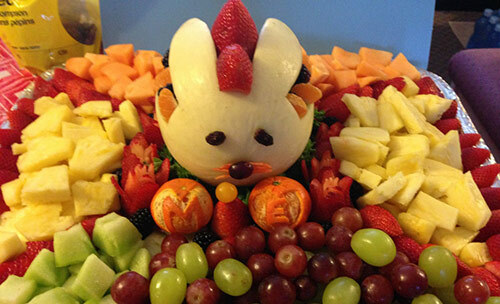 The melon bunny is a great centerpiece for a fruit tray. Which of these Easter food decorations is your favorite? You can see some fun Easter egg decorating ideas here. Want to Share Your Easter Food Decorations? If you are a student of my lessons, I’d love to see your Easter food decorations. To share your photos, reply to one of my emails and attach your best photos.